Arabian Queen beat Frankie Dettori's Golden Horn to gain a shock victory in Wednesday's Juddmonte International on the first day of York's Ebor Festival. 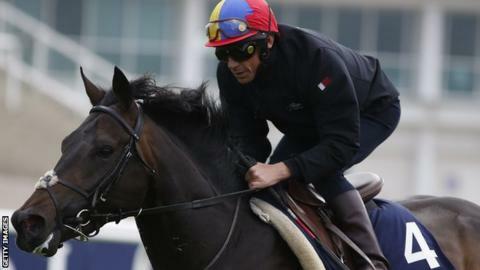 The 50-1 shot, ridden by Silvestre de Sousa, edged the previously unbeaten 4-9 favourite Golden Horn, who has won the Dante Stakes, the Derby and Coral-Eclipse Stakes this season. "Of course I am upset," Dettori told Channel 4 Racing. "He only just got beaten, but he laboured today." The Grey Gatsby finished third. Gleneagles, the 2,000 Guineas winner, had been due to line up against Golden Horn but was ruled out because of the rain-softened ground. That left Dettori's mount in a strong position to challenge for victory, but it was Arabian Queen who hit the front more than two furlongs out. Golden Horn made his move and pushed hard in the closing stages but Arabian Queen held on to win the Group One event by a neck. There was an eerie silence as it dawned on the big York crowd that the odds-on favourite had been beaten. Arabian Queen was another notable victory for trainer David Elsworth, who guided Desert Orchid during his outstanding career over jumps. Observers described the ground as sticky and Aidan O'Brien will be relieved he did not run Gleneagles, who needs fast conditions and will now be aimed at next month's Irish Champion Stakes.